Food Costs > How Much Does Romaine Lettuce Cost? How Much Does Romaine Lettuce Cost? Romaine lettuce is a variety of lettuce that grows in the tall head of sturdy leaves rather than the small round head of lettuce such as iceberg lettuce. Romaine lettuce is preferred by many people over other lettuce types for its crispness and sweet flavor. It is commonly used in a Caesar salad and in Middle eastern cuisine. On average, a head or package of romaine lettuce hearts is going to range anywhere from $3 to $6 at your local grocery store. The costs will depend on the grocery store, the type of lettuce and time of year. At Sam’s Club, for example, a six-count bag of Romaine lettuce hearts retails for $4. According to the USDA, a full head will cost $1.84 per pound on average, whereas the hearts will be closer to $2.75 per pound. A local farmers market may sell by the head for around $3 to $5 each. It was reported by ABC, that at one time, lettuce prices in the west rose to almost double the price due to freezing temperatures in its location sources in southwestern Arizona where most of this produce is grown during the winter. When this happened, the price of a carton from the sources jumped to $25 from what used to be $8. Any changes in the prices at the source will trickle down to an increase in prices for retail consumers. The season of the year will affect the price of romaine lettuce since it is grown more efficiently in the summer months. The store you buy your romaine lettuce from can determine the price you pay. If it is a regular grocery store, it may be on the cheaper end, but if it is in a health food store that carries mostly organic food, it will be on the higher end of the price range. The more romaine lettuce you purchase at a time, the cheaper it will be. For example, purchasing romaine lettuce from a warehouse will cost less per head than it would in a grocery store. 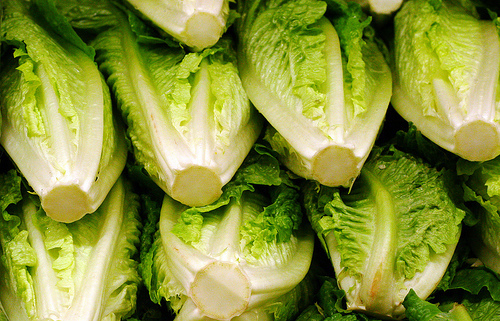 At a local grocery store, the romaine lettuce won’t be packaged like a head of lettuce. Instead, it will be referred to as a “heart,” and will often be packaged inside a clear plastic package. Inside, depending on the brand, should include three to six hearts, but some bags can include the hearts already chopped up and ready to serve. At a local farmers market, however, it may be sold by the head. Most of the romaine lettuce harvested in the United States will come from California, and it will readily be available all year. One serving (2 cups) of romaine lettuce provides over 100% of your daily value of Vitamin A and Vitamin K. In addition, it is a good source of Vitamin C, folate, phosphorus, magnesium and potassium. Romaine lettuce tends to be crispier when the heads are mature. When choosing at a local grocery store, pay close attention to the leaves. You will want to make sure there are no wilted leaves or slimy-looking spots. In addition to this, the ends should be free of any yellow or brown discoloration. After purchase, romaine lettuce can be kept for up to five days; however, the faster you eat it, the fresher it will taste. According to Dr. Axe, romaine lettuce offers 10 great benefits. It helps with digestion, can help with weight loss, maintains a healthy pregnancy, helps fight cancer, boosts your immunity, helps heal skin, promotes eyesight, boosts your heart health, helps prevent bone loss and is an excellent source of Vitamin A and Vitamin C.
Romaine lettuce packed in bags and hearts tend to cost a bit more than just romaine lettuce heads. Like anything in the grocery store, this type of lettuce can often be found on sale. Keep your eyes peeled for promotional prices inside their weekly circular. If you are going to make a Caesar salad, there are kits that include the lettuce, croutons, Caesar dressing, and cheese. This will save you from having to purchase each item separately.